My sister, Lisa, gave me a copy of this book for Christmas, and I’ve found it to be a fascinating and unique account of the D-Day invasion. 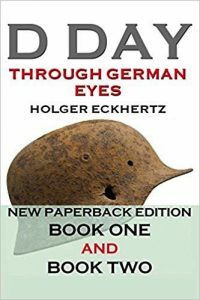 It addresses a real gap in the history of the Battle of Normandy–the perspective of the German soldiers. The editor’s grandfather was a propaganda journalist for Nazi Germany and conducted the interviews of German soldiers in Normandy. The stories are revealing, often harrowing, and provide a window into the battle that’s otherwise hard to come by. The main criticism of the book is that I would have liked to have seen footnotes, photos and more supporting documentation of the German soldiers interviewed. This entry was posted in Blog, I Thought You'd Like to Know and tagged bookimreading, books, DDay, leadership, Normandy, thoughtyoudliketoknow.